Creed has become a niche perfume house. One of the cool stories about Creed is that, it is said that the house creates its perfumes in-house by two perfumers, the father and the son. Creed Himalaya is one example of such products. Inspired by the remembrance of his expedition and mountain climbing experience in the Tibetan land, Olivier Creed, along with his son, Erwin Creed, designed and crafted this perfume together. One thing that we want to note about this perfume is that it requires patience. Quite coincidentally, this goes along with the theme of mountain climbing; you need to have a degree of patience. After application, Creed Himalaya will not immediately showcase its presence. The initial scent is rather weak and hard to notice. It even goes down to near disappearing. However, a short time later, the scent reappears in its true form. So, there is no need to over-apply the perfume, even though Creed Himalaya is one that is difficult to over-apply. Creed Himalaya aims to projects masculine characteristics. It tries to convey the power, magnificence, beauty, and eternity of the snow-covered mountains and peaks. It has generally been successful. It opens with the refreshing and sweet top notes of Calabrian bergamot, grapefruit, and Sicilian lemon. After virtually vanishing for a while, the scent re-emerges, this time bringing the middle heart notes of sandalwood. Here, you can also notice the notes of musk and cedar. The combination creates a citrusy and woody combination. The scent smells and feels masculine and classy. It gives the impression of a man who knows what and how to do without seeing any necessity to boast. Some people say that Creed Himalaya has a degree of aquatic feel in it. Well, perhaps the perfume can be said as an aquatic musk type. The aquatic feel results from the interaction of the citrusy notes and musk. 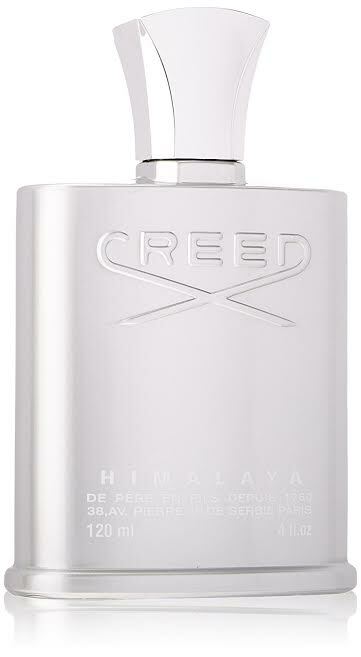 Despite the weak initial projection, Creed Himalaya is actually a fragrance with decent sillage and longevity. The real scent is not weak. It projects well outwards, and it can help to notify others of your presence. It is also quite long lasting as it can last for hours. Perhaps another good thing about Creed Himalaya is that it virtually can’t be over-applied. It can be strong, but nothing being too heavy and intoxicating. Creed Himalaya comes in an elegant silver box. There is an air of luxury surrounding the packaging. The artistic design hints that it is a premium quality product. Inside, the flacon of Creed Himalaya is somewhat unique and distinctive compared to other Creed perfumes. It features a metallic exterior, which resembles a mountaineer’s canteen. It may also remind you of the shiny surface of ice on mountain rocks. It certainly makes a great collection, if you like to collect and display your perfumes on your shelf or drawer. Check the best price of Creed Himalaya here!